Although it sounds like something you might find tucked away in Monica Lewinsky's bedside table, the electronic cigar is a SMOKE. Give it its full title, "Natural Wood Effect Electronic Cigar" and you would think that it belonged in Bill's bedroom, though. 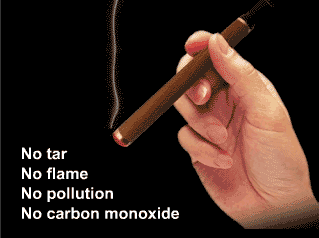 It works on the same principle as most electronic cigarettes—see how in the diagram below.